Our team takes a holistic approach while drafting patent specifications. At InvnTree, patent specifications are drafted by considering foreseeable challenges in prosecution and enforcement across major jurisdictions, thereby ensuring our clients’ short and long terms interests. We engage with various stakeholders at our clients’ end to understand, not just the technical objectives, but also the business objectives and competitive advantage sought from the patent, and prepare specifications that are equipped to meet such goals. Each patent specification goes through a rigorous quality control process involving multiple team members at various stages, resulting in patent specifications of remarkable quality. 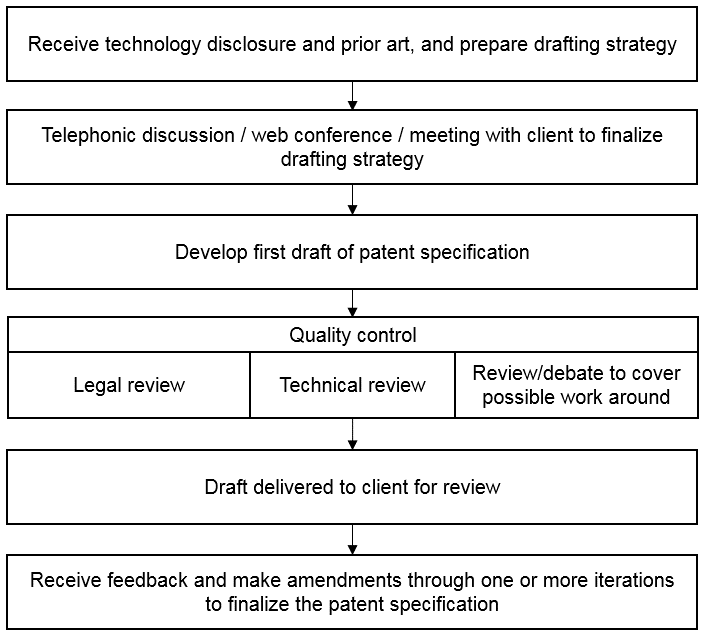 A flowchart is presented below that provides a brief overview of the workflow followed by us for drafting patent specifications.